So when I started jumping up and down, celebrating my first victory, she told me she wasn’t going to play with me anymore if this was my sportsmanship when I won. I have learned a lot from my Nana. As the years have gone by we became more evenly matched, and we just enjoyed playing. 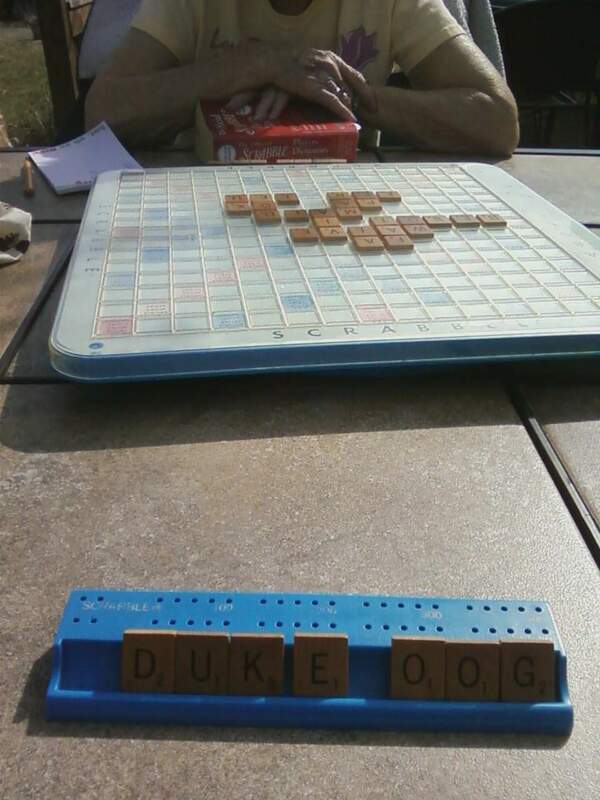 We’d be pumped when one of us played all their letters or used an interesting word. The best was when we could play on the deck when the weather was nice. I even made a Nana Playlist on my iPod of Glenn Miller Band, Bye Bye Birdie Soundtrack, Beach Boys and other oldies, silly songs, and Disney soundtrack tunes to listen to on those days. I’d crack up because inevitably she’d get up and start dancing when one of her favorite songs would come on. I lost my Nana on March 11th. And the thing I will miss most this summer is those games and her dancing on the deck. So in honor of her…here’s two of her favorite dancing songs from the Nana Playlist. I hope they inspire you to dance. I can only do my best with what I have in my hands right now. My resources are finite and limited. But God is unlimited and the definition of infinity and beyond! He is the beginning and the end and everything in between. “And my God will meet all your needs according to the riches of his glory in Christ Jesus.” Thank you Apostle Paul for that reminder in Phillipians 4:19. Point to ponder while you wander…A Father who loves me with infinite resources and everlasting love now that is something worth rejoicing in and being grateful for! When you chose to receive Jesus as your savior, you went into right standing with God immediately! You will probably need to work out some behaviors, thoughts, beliefs, and the like. But as far as God is concerned you’re in the clear. When you condemn yourself (meaning to disapprove of, criticize, revile, berate, find fault with) you are actually arguing with Jesus who is pleading on your behalf! Stop arguing with Jesus! Love yourself! Love yourself right now. Just as you are. You are worth loving. You are beautiful. You are valuable. Jesus believes you are worth it, so you should too! Still is H7503 raphah…to sink, relax, let go, abandon, to be quiet. Visualize sinking in a hot bubble bath and breathing deep. Some times in the middle of the biggest storms you have the deepest peace. That’s the peace Jesus left with us when He ascended, the kind that allows you to sleep in the boat during a hurricane. To me the biggest miracle wasn’t Jesus calming the storm, it was Jesus being able to rest in the middle of the storm. God is good. He gives everyone the same love, the same hope, and the same right to choose. The rest is up to you. It makes me angry when people blame God when people are sick or dying. God didn’t give your loved one cancer or anything else. He doesn’t have sickness to give and it’s not who He is. God gives life. He sent Jesus to take sickness and defeat death. God is good. Sometimes the choices that lead to someone’s illness came from their bad choices or someone else’s. Sometimes there’s no one at fault. Sometimes bad things just happen. But blaming the One who loves you more than anyone else could possibly attempt to love you and distancing yourself from Him when you’re hurting or grieving is the opposite of what you should be doing. 1. God is for you, not against you. 2. God turns things around for good to those who love Him. 3. God is good. All day every day. 4. God is hopelessly in love with you. 5. Jesus came to save the world, not condemn it. 6. God doesn’t want a single person to perish. Hell was originally created for Satan and the angels that followed him…not for humans. 7. Jesus thinks everything He went through was worth it…because it was for you…the one He loves. All this is true. Reread it. Meditate on it. Bathe in it. Stew in it. Whatever it takes for you to understand and believe it. Point to ponder while you wander…God is good. And we are equal in His eyes. He has no favorites. He works within the confines of our choices to bless us as much as He can. Why? Because He’s good! In continuation of my random post last week on my love for Davy Jones…here’s a few of my favorite Monkees’ songs. Part of the fun of the Monkees is that the videos are so fun and random. My inner kid still LOVES them. Shades of Grey. I always thought it was a pretty song, but the older I get, the more I appreciate the meaning of the lyrics. It’s probably my favorite. Gonna Buy Me A Dog. It’s funny. Listen to it. And last but not least….Daydream Believer.